Two minutes. Two luscious little banana pie cups. Two people wondering how such a tasty dessert could possibly be a HEALTHY LIVING recipe. 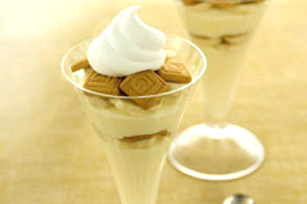 Layer half each of the pudding, bananas and cookies alternately in 2 dessert dishes; repeat layers.